There can be no complaints about parsimony in the case of the Universal Group's Panorama series. The discs are packed tight however playing time is not a virtue in isolation. The performances and recordings need to be good as well. The strength of this new budget level contender is that it uses recordings already tried and tested. Universal can draw on the classical vaults of Decca, DG and Philips so we can expect (and usually get) memorable music making. Karajan's Boléro, aptly remorseless and enjoyably slick, is bedevilled with some hiss (rec 1966). Boulez's Valse (rec 1995) swirls in great gestures, conveying an impression of a colossal visionary dream, emphatic and broad at its close. Argerich (a common presence throughout the pair of discs) is a Ravel specialist having recorded the concertos at least twice. Her volcanic brilliance in the G major (rec 1988) conspires with a recording of sonic depth to bring the listener a vivid canvas. The performance has a delicacy (middle movement) allied with a grand sound-picture. There is some stunning woodwind playing at start of final movement. Her glittering virtuosity, casually delivered, also illumines Jeux d'Eau and Gaspard (rec 1961 and 1975). The Rapsodie (rec 1974) tends to emphasise Eusebius at the expense of Florestan with languor giving way to the feria elements. The Pavane's regretful elegance and frozen beauty plays out the last track and prepares for a tense and dreamlike Daphnis Second Suite. 2 which has you by the lapels. I liked this although I know that some have found it all too tense. The Piano Trio is given a controlled and refined interpretation responsive to the tidal flow of the music. Tzigane is both honeyed and zestful in the hands of Accardo and Abbado. A good collection; nicely prepared and presented. 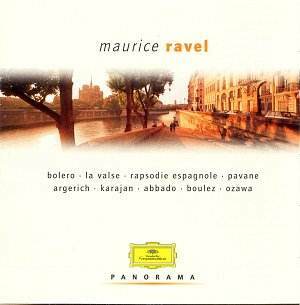 Excellent introduction to Ravel.